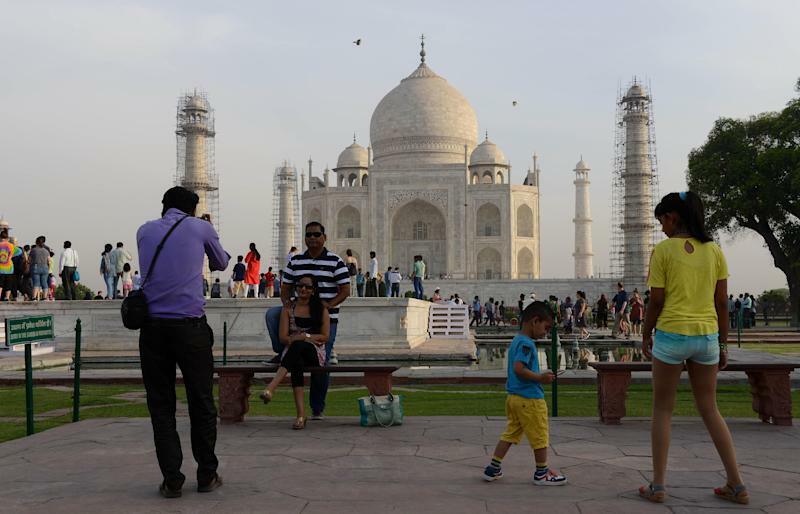 Scaffolding will cover the Taj Mahal's main dome next year while a "mud pack" is applied to its yellowing marble, authorities said Thursday as they battle the effects of smog on the country's top tourist attraction. The famed monument to love, which attracts millions of visitors, has for years been acquiring a yellow tinge despite a ban on coal-powered industries in the area. Authorities have been applying "mud packs" around the side walls and towers since last year to draw the impurities out of the stone, but have not yet touched the main central dome. "This is a part of the cleaning process through mud-pack therapy and is presently being undertaken at (the) eastern wall of main mausoleum of Taj," said Bhuvan Vikram of the Archaelogical Survey of India (ASI), a state body. "This would be followed by cleaning of other three walls (and) thereafter it would be the turn of the (main) dome of Taj Mahal." The mud-pack therapy involves covering the surface with fuller's earth and leaving it to dry before removing it with soft brushes and distilled water. The Times of India said the scaffolding could be up for around six months. ASI official M.K. Bhatnagar said the scaffold would go up around the main dome some time next year, but would not say how long it would be there. "The time for cleaning cannot be ascertained in advance as it depends on work required on the dome," he said. "It (the therapy) would take time but we will make all efforts to minimise it." The Taj Mahal was built by Mughal emperor Shah Jahan as a tomb for his beloved wife Mumtaz Mahal, who died giving birth in 1631. It has attracted world leaders and royalty including former US President Bill Clinton. Diana, the late British princess, was famously photographed alone on a marble seat there in 1992. In May, authorities had ordered an investigation after green-tinged patches began appearing on the back wall of the monument, which stands on the banks of the heavily polluted Yamuna river. India has some of the world's worst pollution and is the third biggest carbon emitter.